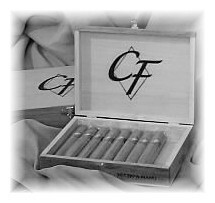 Cigars and Cigar Rollers from CF Dominicana Cigar Co.
Cigar Rollers roll CF Dominicana Cigars using high quality Dominican Ligero Long Filler in Beautiful Connecticut Shade or Deep Maduro wrapper. "Ligero" are leaves found in the middle of the plant which produce a greater, full flavored taste and is the dominant leaf used in the blend of CF Dominicana Cigars. *Models shown are our most popular, all sizes are available - we are the manufacturer. CF Dominicana Cigars also keeps consistent to the core of the brand - our premium cigars. Mild to medium bodied, our product is derived from a wonderful blend of Dominican Ligero/Seco filler in the highest end Connecticut Shade Broadleaf. Golden Brown, no discoloration, no veins and what every major brand considers to be the pinnacle of wrapper tobacco the Windsor, CT famous is the absloute companion to every one of our Connecituct Shade models. Our maduro models use deep, dark, aged Ecuadorian leaf to bring a bolder taste and compliments the Dominicana blend beautifully. Custom Cigars are ordered daily and we encourage you to inquire. There is a special, personal feeling that comes with a box of cigars that are rolled specifically for you. Your choice of size, shape and wrapper (Connecticut Shade/Maduro/Indonesian/Sumatra) is possible. We'll even design Custom Cigar Bands with your initials (see our Custom Cigar Bands page). We also offer our Gourmet Flavored Cigars which we introduced along with our e-commerce site, www.CigarFlavors.com. Our Gourmet line is one of the few, if not the only, that uses Dominican long filler and Connecticut Shade wrapper. Connecticut Shade is uncommon for flavored cigars as the tobacco needs extra time to dry due to the natural extracts that are added. Visit www.CigarFlavors.com for more on our Gourmet Flavored Cigars.